Okay! I finally sorted through the megaton of photos and whittled them down and now we can commence with the cutery and weirditude. Japan was great. I wanted to go someplace really foreign to me, and it certainly was that. You know how in, like, Europe or South America or Africa they use the Roman alphabet so even if you don’t know what you’re looking for exactly you can sound it out or at least recognize the order the letters are in and use that? You can even do that with Cyrillic. Not in Japan. Three alphabets. Three. One of them is crazy convoluted and every character looks like a maze. You cannot sound that stuff out. If the sign isn’t in English, you are S.O.L. Now a great many signs are in English, but then a great many are not and The Moomins and I were completely in the dark. Let me tell you about the street system. Fun fact: Many of the streets have no names. Yup, you heard me right. No names. And the houses are numbered by the order they were built, so 22 could be next to 458 which is next to 3. The post officer’s jobs are nightmares. Don’t believe me? 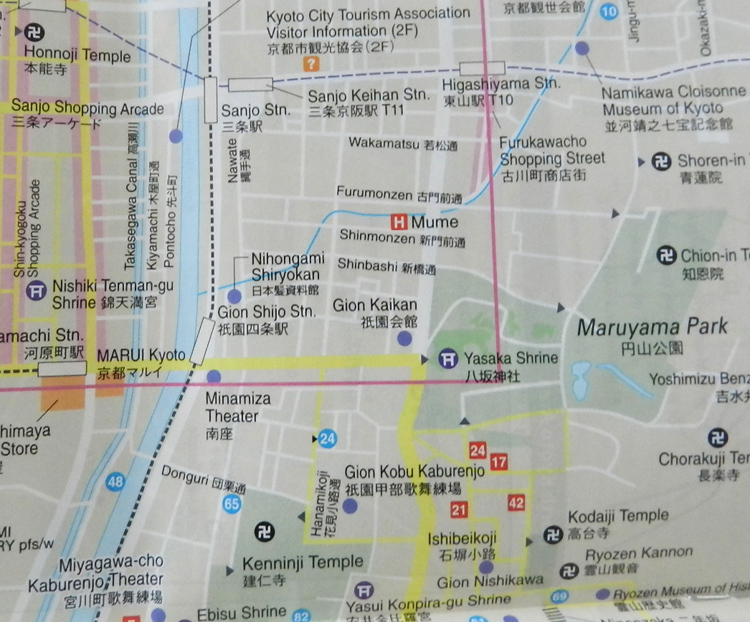 Look at this small chunk of a map of Kyoto. It can get rough if you stop paying attention. A lot of directions involve instructions like, “When you get to a corner with two lanterns and a Family Mart, make a left.” And don’t be concerned about the swastikas, they represent Buddhist temples. I saw them everywhere. I thought I would have a visceral reaction to them, but they didn’t bother me a bit. They always showed up in the most soothing of places so maybe, if I lived there, I could retrain my brain that they’re a good thing. No more wincing at swastikas would be nice. I’m going to do this chronologically because I think it will give you a better overview of the trip. First there was the 12-hour plane flight which I couldn’t sleep on because I didn’t take any sleepytime drugs and the seats are not comfy. It was cool, I watched movies the whole time. Delta has an amazing selection of movies and they leave all the cursewords in! I sent them a letter saying thank you for not tampering with my entertainment. Anyway, we landed and I had been up for twenty hours and was exhausted and looking forward to going to the hotel and passing out on the bed. However, it was not to be. It had snowed the day before in Tokyo, the most snow they had seen in forty-odd years and they didn’t have the manpower or supplies in place to deal with it. Then the highway had black ice so they closed it. This is the only highway that goes from Narita to Tokyo, which means no shuttles, buses, limos or cabs. 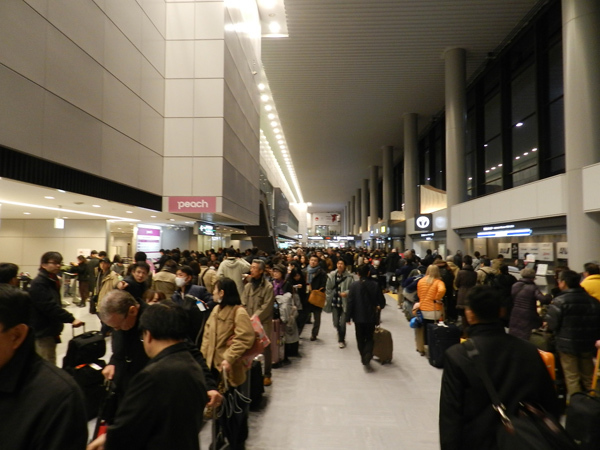 We arrived and stood in a line outside freezing because there was a rumor some cabs were making it through. After two hours though it was clear that was not going to happen, so The Moomins and I went into the terminal. It was not a good scene. 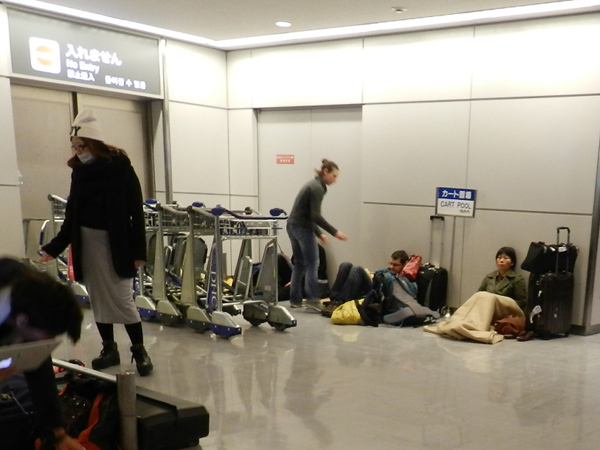 The airport was handing out sleeping bags, blankets and bubble wrap to people and they were setting up camp anywhere they could find a place – under the stairs, in the hallway to the bathroom, directly in front of the taxi and shuttle counter (no one was using it anyway). It was bleak. I was ready to set up camp somewhere and taste the glorious dream-state that was being painfully withheld from me, but The Moomins would have none of it. She said she was old and we had booked a hotel room with beds and paid for it already. By Jove, we were going to sleep in those beds even if we had to bribe someone to lift us via helicopter to Tokyo. It turns out that the JR train (similar to Amtrak or Metro-North) was still running, so we got on line for that. The longest line in the history of lines. It snaked back and forth through the entire terminal, folding over itself four or five times. The next day was going to be vastly better because I was going to the Ghibli Museum. I went to sleep thinking about the fact that HOLY CRAP I’M IN JAPAN. And the toilet seats are heated and how glorious that is. More on that tomorrow. I’m back from my Japanese journey and I’ve started sorting through the 1,000+ photos I took. 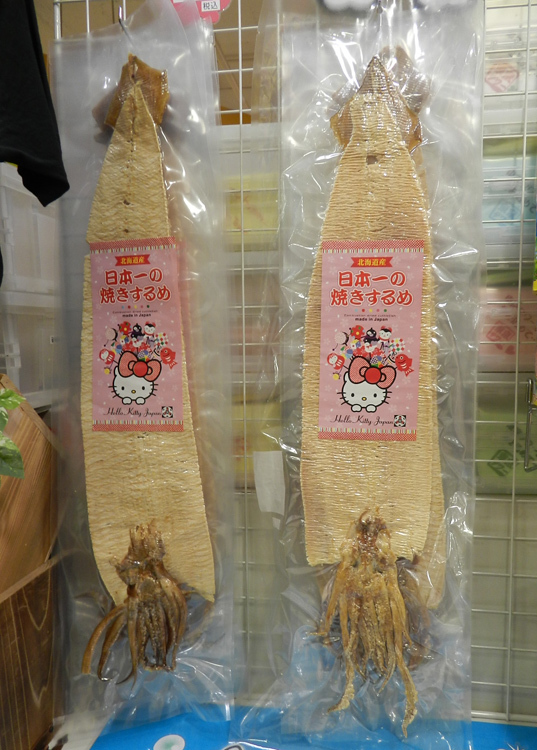 While I’m getting going on the blogging, please enjoy these two quintessential photos of Japan. 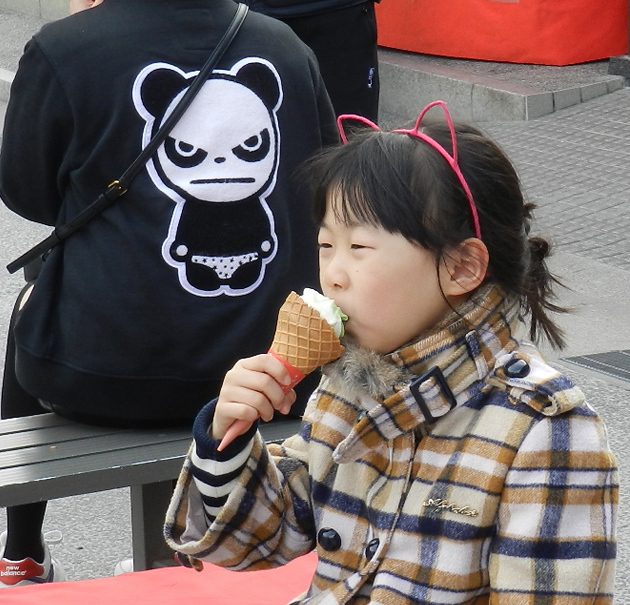 One is a Hello Kitty branded giant dried squid, and the other is a little girl wearing a cat-ear headband eating green tea ice cream with someone in the background sporting a hoodie with a kawaii angry panda on it. BOOM. JAPAN. NUTSHELL. Off to frolic with Totoro. Alright everyone, I shall be gone for two weeks in Japan. I will return on the 23rd, when I will begin the sorting and uploading of what will no doubt be a heaping great pile of photos. Enjoy this charming weather until my return and I’ll see you all when I get back. Wow. 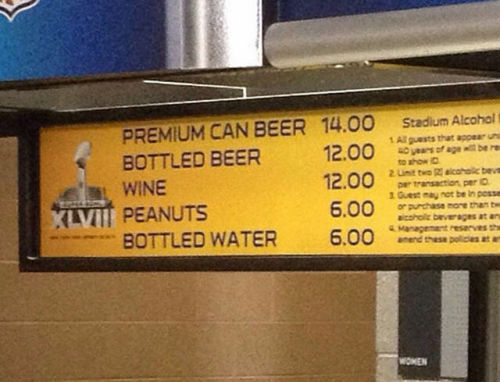 Did everyone catch that amazing Super Bowl? Where the guy did the thing, and everyone cheered? That was something else. Truthfully, I didn’t watch. I came home at 9:30 at night and caught the last ten minutes when the Seahawks had destroyed the Broncos and everyone was just killing time until the pain was over. In case you didn’t watch (and chances are if you read this blog you did not) the final score was 43 to 8, Seahawks. I assumed that there would be two NFL teams playing, not one NFL team and a bunch of homeless people they rounded up from outside Metlife Stadium, but apparently I was wrong. Listening to the announcers try to fill up time in the fourth quarter when the game was clearly won was sad. I’m surprised they didn’t start reading their mail on air. Anyway, hooray or I’m sorry depending on which team you were rooting for and good luck to whoever plays next year that I will pay just the smallest amount of attention possible to. And concerning the commercials: eh. I saw most of them and I didn’t really care about any of them. Radio Shack was good. Doberhuahua was decent. The Bud Light commercial was great only because Reggie Watts and a llama were in it. Other than that, whatevs. None of them were on par with the Mercedes chicken commercial. That, that was a masterpiece. Addendum: ARE YOU KIDDING ME. You are currently browsing the design-newyork.com blog archives for February, 2014.